What are Hatchimals, how do they work, and where can you find them? - They are furry robot creatures you hatch from eggs - really! If Furby and Tamagotchi got together and had babies, they'd have Hatchimals. Hatchimals are the latest toy craze and must-have toy for the 2016 holiday season. You probably saw a lot of people talking about these things over the past few weeks, including celebrities, such as model Chrissy Teigen, who posted several videos to Instagram and Snapchat of her getting a Hatchimal. She spent the better part of Christmas day trying to hatch her egg and pretending that it was really for her newborn child, Luna. Confused? No worries. Here's everything you need to know about Hatchimals. Hatchimals are the new "it" toy for Americans. And, yes, they really hatch. Created by toymaker Spin Masters, Hatchimals are practically impossible to find in actual stores. They're that in demand. They are basically little robot animals that come inside plastic eggs. In order to play with these plush, Furby-like creatures, which sort of look like penguins, you hatch the egg. Once you do, you can teach Hatchimal to walk and talk and play games. It grows from being a baby to a toddler and ultimately a kid. You have to care for it, paying close attention to its eye colour to understand how it feels, and then you can respond accordingly. If it has purple eyes, for instance, it's hungry and needs to be fed. Sounds a lot like Tamagotchi, right? Hatchimals: How do you hatch Hatchimals? Just like a real egg, your Hatchimal will only hatch once, and then it will want to walk, talk, and play. Freeing this little beast will take “anywhere from 10 to 40 minutes," according to the toy’s website. Just rub, touch, and tap the egg. When it’s ready, you’ll see it peck its way out. At that point, you can peel away parts of the shell to help it come out. You won't know what your Hatchimal really looks like until it's freed from the egg. Note that your Hatchimal can't hatch without you holding the egg. Also, Hatchimal is a toy, so of course it makes noise - a tonne of it. Before the Hatchimal pecks its way out of the egg, you can sometimes hear it snoring. Watch the videos here to see what we mean. However, after hatching, you are able to turn down the volume and play in half volume mode. Hatchimals: What are the different stages of life? Hatchimals have five stages of life: egg (you must nuture the egg by tilting it, tapping it, and touching it), hatching (you must help Hatchimal peck its way out by rubbing the egg), baby (you must care for it by cuddling it and feeding it), toddler (you must teach it how to walk and talk), and kid (you must play games with it). Your Hatchimal is full size when it hatches, but it'll develop new abilities as it gets older. Hatchimals: What do the eye colours mean? You'll see rainbow eyes appear when your Hatchimal is ready to hatch or when you've unlocked a new stage. Here's a handy cheat sheet that describes the different eye colours you'll see when Hatchimal is escaping the egg and finally out of the egg. Each colour has a different meaning and requires a specific action from you in order to ensure a healthy and happy Hatchimal. Hatchimals: How do you teach Hatchimal to walk and talk? You can teach your Hatchimal to walk, talk, play tag, etc. Just press and hold its belly while you speak to teach it to talk, and it'll repeat what you've said. You can also press its belly repeatedly, causing its eyes to flash white, and that point you can clap once to make Hatchimal move forward or clap twice to make him spin. But be careful - too much spinning can make him sick. 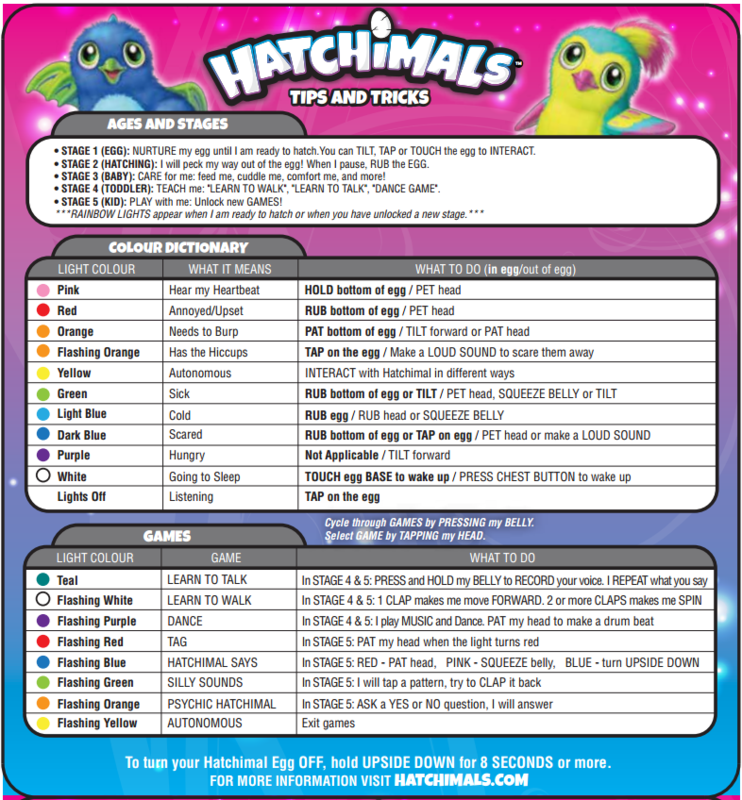 Go here to learn more about what you can teach Hatchimal. Hatchimals start at $59.99 (£59 in the UK). Where can you buy Hatchimals? If you're lucky, you can find them in US and UK stores. You can also get them online through Amazon, Kmart, Target, Toys R Us, Walmart, Argos, and Spin Master. Walmart sells an exclusive "Burtle" edition with antennas as well.